In other CNN reporting on the situation here…..I was sitting in Bangkok, less than one city block away from where a CNN reporter was “live on location”, I was shocked at what was being reported. I was not seeing or hearing the same thing CNN was reporting about. I was following 8 different local and international journalists on twitter, their tweets didn’t match what CNN was reporting. The CNN reporter barely had any grasp of the situation, she was stating obvious fact about the conflict and completely unable to deliver any relevant insights. I would expect most know not to take all that is reported as fact; I was amazed how the live reporting was distorted. 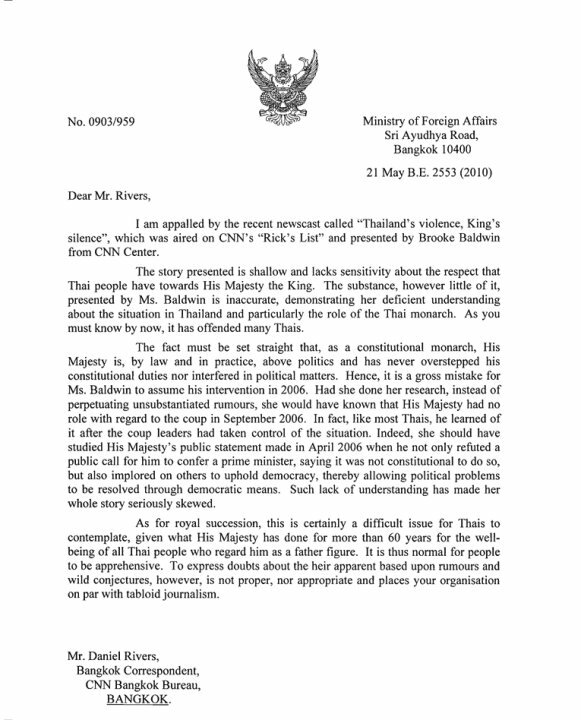 I encourage you all to demand better fact checking and reporting from the media, please read the letter from the Thai Foreign Ministry to see details of the inaccuracies of one CNN report. This entry was posted in Bangkok, Culture, Politics, Thailand and tagged Bangkok, Bangkok protest, Bangkok TV, CNN, is bangkok safe, Red Shirt March, Red Shirt Protest, red shirts, Red Shirts in Bangkok, Red Shirts Protest, Thai newscast, Thailand, Thailand Politics, travel to Bangkok now. Bookmark the permalink.